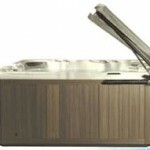 Hot tub accessories can help make spa time more enjoyable. Some accessories such as cover lift devices, spa steps and floating spa covers can increase the utility, safety and energy efficiency of the hot tub. 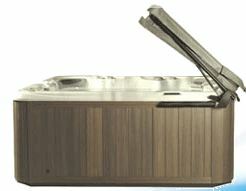 Hot tub steps are necessary with deeper or taller spas for safety and to get in and out of the spa easily. Some hot tub spas also have built-in safety steps in the inside of the spa so you can step down and enter the spa safely as well. 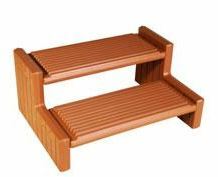 Safety steps are made of hard plastic materials these days although they were previously made mostly out of wood. The same trend has happened with spa cabinets which are now mostly made out of PVC or other hard plastic material rather than wood, which requires maintenance and periodic re-staining. A cover lifter can help one person remove the big spa cover by themself. There are several types of cover lifters that either mount to a deck, mount to the spa skirt/cabinet or mount with undercabinet mounting plates. Check the maximum cover dimensions for the cover lifter you decide on to make sure it will work for your particular cover. Hot tub fragrances help create the right mood, and there are even fragrances for kids. Liquid fragrance made especially for hot tubs can be safely added directly to the water. Aromatherapy systems sold by hot tub manufacturers are typically plumbed into the blower line (so the spa has to have a blower to accommodate this type of aromatherapy dispenser). The air from the blower travels through a canister where dry fragrance packets are placed. The aromatic air is then dispensed through the spa’s air jets and creates the scent as the spa bubbles. The easier and more widespread type of aromatherapy to use on a spa are the liquid kinds. Not all aroma should be used in hot tubs, as some contain oils which can clog the filter or cause excessive foaming. InSparation is one brand of spa fragrance that has been used for many years in most every brand of spa. Hot tub toys are also available to increase the fun. From hot tub waterproof playing cards, rubber ducks and hot tub chess sets, to floating radios and stereo remotes, the toys are endless. For hot tub therapy, there are some good books available to suggest water exercises and hot tub fitness regiments. Even just soaking in the hot tub can burn calories, increase blood flow and circulation, and release endorphines in the brain that create a positive sense of well-being. Accessorize and get the most out of your hot tub spa.